The brain's structure may predict whether a person will suffer chronic lower back pain, according to researchers who used brain scans and say the results support the growing idea that the brain plays a critical role in chronic pain, a concept that may lead to changes in the way doctors treat patients. Chronic pain affects up to an estimated 100 million Americans and could cost the United States hundreds of billions of dollars per year to treat. Lower back pain represents about 28 percent of all causes of pain in the United States; about 23 percent of these patients suffer chronic, or long-term, lower back pain. The researchers scanned the brains of 46 people who had low back pain for about three months before coming to the hospital but who had not had any pain for at least a year before. Scientists used the structure of the brain's white matter (green lines) to predict whether a subject would recover from low back pain. 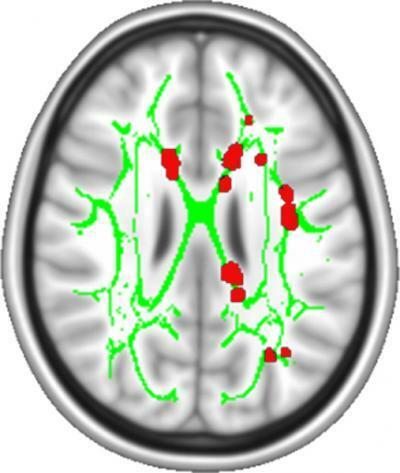 Red dots represent differences in white matter structure between subjects who recovered and who suffered chronic pain. Courtesy of Apkarian lab, Northwestern University Feinberg School of Medicine. The researchers scanned the subjects' brains and evaluated their pain with doctor's examinations and questionnaires four times over a period of one year. About half of the subjects recovered at some time during the year; the other half had pain throughout, which the researchers categorized as persistent. Previously, they showed that the volume of grey matter in the brains of the same subjects who had persistent pain decreased over the same year. Grey matter describes the area of the brain where the central bodies and branched antennae, or dendrites, of nerve cells reside. They also showed that brain activity could be used to predict whether a subject recovered or experienced persistent pain. "We may have found an anatomical marker for chronic pain in the brain," said Vania Apkarian, Ph.D., a senior author of the study and professor of physiology at Northwestern University Feinberg School of Medicine in Chicago. "Pain is becoming an enormous burden on the public. The U.S. government recently outlined steps to reduce the future burden of pain through broad-ranging efforts, including enhanced research," said Linda Porter, Ph.D, the pain policy advisor at NINDS and a leader of NIH's Pain Consortium. "This study is a good example of the kind of innovative research we hope will reduce chronic pain which affects a huge portion of the population." "Currently we know very little about why some patients suffer chronic low back pain," said Debra Babcock, M.D., Ph.D., a program director at NINDS. "The earlier we detect pain will become chronic, the better we may be able to treat patients." Apkarian and his colleagues addressed this by scanning the brains of 46 people who had low back pain for about three months before coming to the hospital but who had not had any pain for at least a year before. "Our results suggest that the structure of a person's brain may predispose one to chronic pain," said Apkarian. "We were surprised how robust the results were and amazed at how well the brain scans predicted persistence of low back pain," said Apkarian. "Prediction is the name of the game for treating chronic pain." "Our results support the notion that certain brain networks are involved with chronic pain," said Apkarian. "Understanding these networks will help us diagnose chronic pain better and develop more precise treatments."